I walked into the local post office this evening to drop a package in the bin, and a young woman was sitting by the door on a blue plastic mail tub turned upside down. She was packed for travel — her belongings in disposable sacks — but she didn’t appear to be going anywhere. It’s unusual for anyone to be hanging out in the p. o., and as I left the lobby, I said to her, “Is everything OK?” “Not really,” she answered. Me: “Do you need some help?” She: “Yes, but I don’t suppose you’ll be able to do anything.” I’ve been out of the “homeless business” for several years, but, as things happen, the h.b. doesn’t let me go, probably because people without homes are everywhere. “So what’s going on?” I asked her. “I need a place to stay for a couple of nights,” she answered, “I’m about to be out of a place to live.” She made it sound immediate and temporary, but I wondered if it was and asked, “Are you sleeping out tonight?” — not a good idea for anyone, and never for a woman alone. She said yes. “I know a few people I can call who help people who are homeless…” I hesitated, “I don’t know if you are…” “I am,” she replied. “Well, let me go to my car and get my phone and make a couple of calls,” I responded. “If I don’t reach anyone, I will give you some numbers to try later if you have a mobile.” “I do,” she said. I asked her first about the local shelters, and she knew the ropes — too late to get in. I mentioned the possibility of emergency beds opening at midnight for overload, but she said that would only happen if the temperature was below freezing. “Should be 40 degrees,” I commented, for no reason, as it’s in the 70’s here today. As I got back into my car and reached for my phone, I felt in a hurry — I was doing errands on my To Do List, and was running behind schedule. “Oh, no you don’t,” I chastised myself for feeling that there was anything more urgent than this lost young woman who had crossed my path. One of the things I’ve learned since being out of touch with “the street” the past few years is that one forgets… about what matters, about how it never is Us and Them, about the primacy of Now. We want life to be slick and smooth, and every cultural message around us tells us that is should be… but it isn’t. I used to take strangers in my car from time to time, but I’ve stopped for a couple of reasons. Firstly, it started to feel like not-the-right-thing for me to do. But most importantly, my eleven-year-old granddaughter, who is very wise, learned about it and asked me just last week if I did it still. When I said not usually, she replied, “Good, I don’t think you should.” I trust her judgment. Back in the p. o. lobby and ignoring that judgment, I told Lakita, “I’ve found you a place, and I’ll take you there if you want to go.” She hesitated and asked where it was. I told her — “Not the best neighborhood, I know, but you’ll be safe there” — but she shook her head. “OK,” I said, “then here are the numbers of some people who can maybe help you tomorrow. If you get in trouble tonight, I think it’s safe these days to call the Dallas Police — didn’t always used to be, but I think things are better.” “Oh, they know me,” she smiled, “It depends on who’s on duty.” “So I’ve heard,” I smiled back. Gallows humor. “Best of luck,” I told her. “Thank you,” she said, and I left the building. The Boston area has been slammed by an unusually large amount of snow this winter, even by New England standards — six snowstorms in a month — but that does not stop John Mark, Judi, Mick, Robert, Scott and the dedicated volunteers of Generic Ministry in the small town Needham, Massachusetts from hitting the streets of downtown Boston every Tuesday and Wednesday night to care for those who are homeless. During a visit to my family in January, 2011, it was my privilege to ride along with this dedicated group for two nights in the midst of the some of Boston’s most extreme weather in years, and to learn a little bit about the situation for our homeless brothers and sisters in the Boston area. Although Boston provides an adequate number of shelter beds for its homeless population, there are always people in any city who are ‘shelter resistant’ — unable or unwilling to cope with going into shelters, often due to mental illness and its ramifications. The Generic Ministry van is equipped with shelves of warm clothing organized by size and type, with hanging racks of winter-worthy coats, with bins of socks, underwear and hygiene products, and with military surplus blankets, all of which are stocked and sorted twice weekly by a ‘behind-the-scenes crew’ made up of Robert (who also coordinates all contacts), Rick, and Scott, and by Martha, who finds online deals for the toiletries. Sandwiches made by school children in Needham and adjacent towns are available, as are bottled water, juice, chips and desserts. After everyone had been served, the remaining sandwiches, chips, desserts and bottled water were given to the formerly-homeless volunteers to distribute among people who sleep in train stations, doorways, alleyways, and on church steps throughout the city. At this point there was ample time for visiting and street counseling. The Generic Ministry volunteers have warm and mutually-respectful relationships with their street friends and seem to know them well. They hand out cards printed with information about shelters, emergency services, medical care and rehabilitation, but their service goes way beyond this. If someone is in need of transportation to a shelter or the emergency room (there are three major hospitals in the area), they will transport them in their van — or call 911 if appropriate, and they keep track of the situations and challenges of individuals from week to week. One of the people I’ll always remember from that first night is Harry. He had brought with him a beautiful spiral bound notebook tied with ribbons, and I saw him ask John Mark for his signature. It turns out he was collecting autographs in celebration of the life of Sargent Shriver and his advocacy for those living in poverty and with disabilities. Then he pulled a twenty dollar bill from his pocket and gave it to John Mark as a donation for the ministry. The next night, as we made the ministry’s usual stops around downtown Boston, Harry met us again at one of the locations to help out. I was sitting in the front seat of the van with the door open, and he came up to say ‘hi’. He was so cold that his teeth were chattering and he was shivering, as the temperature edged in the direction of zero for the second night in a row, but his dedication is such that he had gotten a ride from the halfway house where he lives in a small town outside of Boston to come and aid the ministry. I offered him a blanket to wrap around himself, but he laughed as he declined it — “Oh, I’m not homeless!” he said. 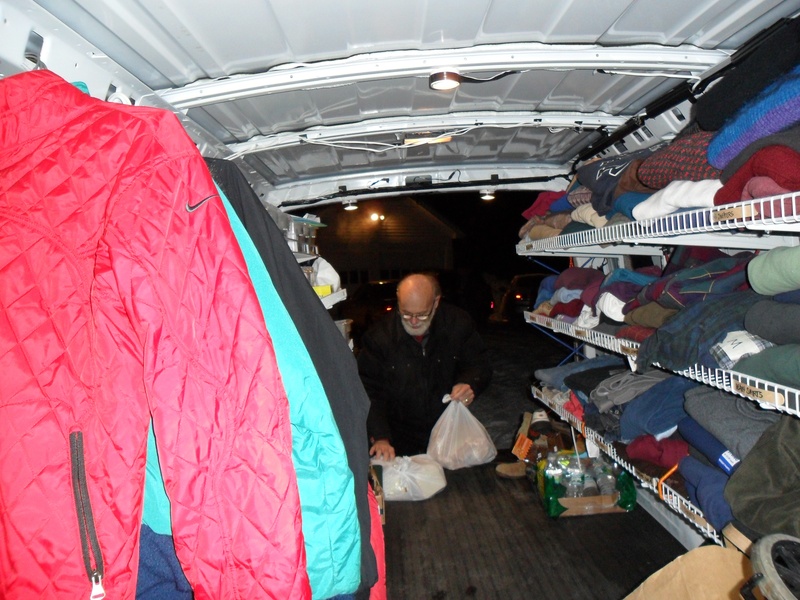 John Mark later told me that Harry had collected clothing for his homeless brothers and sisters in the past and gotten a ride for the half-hour trip to the ministry headquarters to deliver it in person. A highlight of the Wednesday night outing was a visit to the Pilgrim Church Homeless Shelter in Dorchester, Massachusetts, a neighborhood of Boston, where Generic Ministry delivers desserts weekly. The shelter operates without guards, metal detectors or policing of any kind, except for the self-policing done by those who stay there, despite the fact that Pilgrim Center takes in men who have been banned from other area shelters. Out of respect for those who were already bedded down for the night and those who were waiting in line to get in, I walked through quickly, but the order and calm of the shelter space — a church sanctuary with the pews removed — made a deep impression on me. Later, outside on the snow-covered parking lot, I was introduced to the church’s pastor, The Rev. Mr. John Odams, and I asked him how the shelter works so well without guards. “We used to have a policeman on duty, but he didn’t have anything to do,” he told me. “I’m not sure why it works. Maybe it’s because it’s more an atmosphere of a home than a shelter.” A large number of those who stay at Pilgrim Shelter have aged out of foster care, not having been adopted by the age of eighteen, so the shelter is run under the direction of the United Homes Adult Services division of Children’s Services of Roxbury. Keeping an eye on the weather, we left Dorchester and drove into downtown Boston. An emergency weather declaration had been issued for Boston that night — with the expectation of a winter gale predicted for 9 P.M. and slated to bring at least an additional eight inches of snow on top of the approximately four feet that had already fallen this winter — which means any car blocking roads or impeding snowplows can be towed by the city at the owner’s expense. As we drove around downtown, emergency vehicles were busy removing cars that had been left parked in order to make way for snow plows and sanding trucks. Despite the amount of snow that had fallen in the last several weeks, the streets of downtown were clear of snow, having been plowed and sanded aggressively in preparation for the next round that night. The ministry know the whereabouts of a number of individuals and groups who ‘sleep rough’ in the downtown area and makes about a dozen stops on its Wednesday night rounds. In front of a downtown Seven-Eleven, we saw one of their ‘regulars’ — Sammy — sitting hunched over on a low windowsill. Judi got out to check on him, while we pulled over by a snow bank and parked the van next to the sidewalk in the valet area of an elegant-looking restaurant. I was surprised that no one asked us to move, though there were a number police cars cruising the area, as the streets were still actively being cleared of parked cars. Judi came back to the van with the message that Sammy had a leg injury and wanted to go inside somewhere for the night, so together she and John Mark helped him into the van. It had seemed at first that Sammy was willing to go into Pine Street Inn, a major Boston shelter, or to the hospital, but en route to the shelter he made the decision to go back to his camp in the back of a Massachusetts Bay Transportation Authority train station, so we took him there, and Judi and John Mark helped him limp inside. Sammy had left Barbara McInnis House (which provides respite medical care for homeless men and women) against medical advice that same week, and, on our way to his camp, he and Judi discussed his plan for re-admittance. I was struck again by the nonjudgmental and respectful-yet-realistic approach that Judi took with him, acknowledging his rights as an individual to make choices — good or bad — yet encouraging in a calm and supportive way the healthy choice of rehabilitation and medical care. It is because of this non-patronizing approach that Generic Ministry — called ‘earth people’ by their homeless friends — has the trust and confidence of this extremely wary, at-risk population. At one point we parked in a cab stand, and the cabbies waited patiently in line behind us as a small group of people lined up for clothing, blankets and sandwiches and we visited with them. A prosperous-looking man walked by and stopped to watch what we were doing. 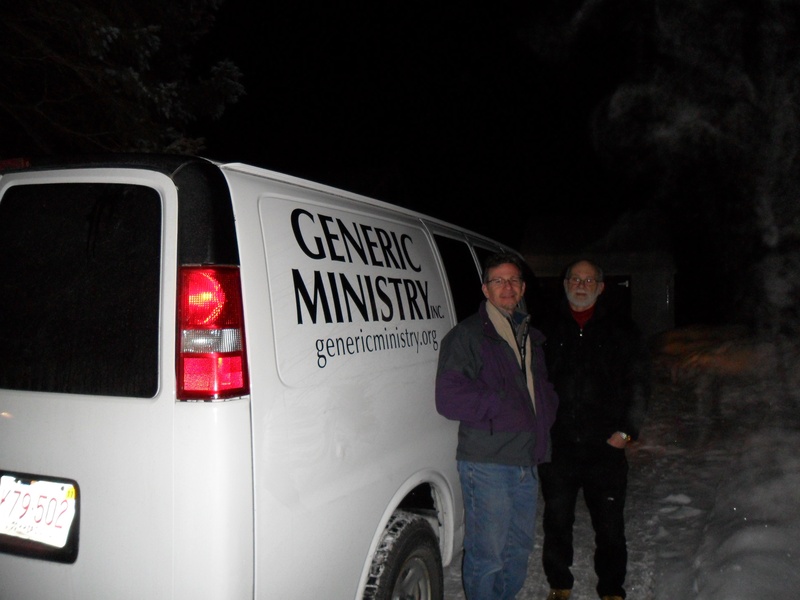 He looked at the ‘Generic Ministry’ name on the side of the van and nodded: “I like it,” he said. As we continued our rounds, including a visit to another MBTA station encampment, I expressed my surprise that people are allowed to seek out and create their own shelter in the downtown Boston area, considering the restrictions on homeless people in Dallas and other cities and the amount of resources that many cities spend on policing to keep them off the street. Here is a conversation from a Boston Herald article which seems to sum up the city’s approach towards it homeless citizens. The article covers a high-profile homeless woman who refused to go indoors for this cold snap, saying she could handle this level of cold. “I’m not that cold,” she said, as she showcased her seven layers of clothing. “I can handle it.”Not possible, Boston police Superintendent in Chief Daniel Linskey told the Pulse. While police can’t force people off the streets, he said, he doubts the wisdom of testing the elements. “This cold is a different type of cold. It’s lethal. You can have negative effects just being exposed to the elements for a few minutes,” Linskey said. This weekend, the city ordered evening shelters to remain open during the day and relaxed requirements for other, sober-only facilities. There’s the obvious threat of frostbite and hypothermia, said Dr. James O’Connell, who provides medical care for Boston’s many homeless. And in extreme weather conditions, chronic medical conditions can really tax the body, he said. “There’s nothing good about staying outside in this,” he said. Each year in Boston, one or two people die from the extreme cold, he said, numbers kept down by active campaigns to get people into shelters…. Yesterday, the city’s push appeared to be largely working. The Pine Street Inn was setting up extra cots to accommodate the overflow crowd, shelter spokesman Barbara Trevisan said. This article seems to represent a fundamentally different view of homeless issues and civil rights than what we are accustomed to seeing in many cities, and certainly in Dallas. Perhaps it can be classified as ‘non-criminalization’. One often hears about the ‘rights of individuals’, but this so often means that the rights of those who have financial means supersedes the rights of those who do not: property owners, business owners and organizations of those who are housed are more likely to be heard than those who are disenfranchised and have nothing. At our last stop, a small tent camp on Boston Harbor that had been in the news because of the city’s efforts to persuade people living there to come inside during the extreme cold, Judi and John Mark delivered some supplies to the campers on foot. Then, as we began the drive home, we looked up at the Boston skyline, which was just beginning to be shrouded in a mist of snow. “It’s here,” said John Mark, of the impending snowstorm. It was making its appearance just over an hour past its predicted start time and had thankfully given us a grace period to complete our rounds. By the time we reached my family’s house about twenty minutes away, the footprints that we’d left on the driveway just a few hours earlier were completely obscured by the steadily falling snow. I have a friend who is unhoused, and I fear he always will be. He’s been given a ‘diagnosis’ — a label for a mental disorder — but he doesn’t necessarily know this, or prefers not to acknowledge it. To get housing, he’d have to sign away his sanity in order to qualify for disability payments, and this is something he’s either unable or unwilling to do. When I read comments on blogs about ‘the homeless,’ and hear them described bitterly — ‘bums, no-goods, get-a-job’ — I think how my friend would be someone the commenters would be referring to if they just saw him on the sidewalk. Except he worked all his life. He also attended two elite universities, excelling in physics and chemistry, and served in the military. But somewhere along the line his mother died, and things in his mind and emotions began to unravel. His last job, which he did faithfully, was drinks manager at a drive-in restaurant. The fog deepened. Before long, he was on the street. I think about him often, worry about him, too. When the homeless-haters talk about the drunks and addicts on the street, I think of how my friend is clean and sober. When they talk about the thugs that are the homeless, I recall his gentleness and nonviolence. I brought him a new coat during the cold winter weather last year, and as he was transferring his belongings from his filthy torn jacket to the new one, I saw that he had one possession — a tattered pocket-sized New Testament. How does he survive out there in the hellish land of street life? It’s hard to imagine and painful to ponder. I question him about it, but his answers, as always, reveal little. They, and he, are enigmatic to a point. I asked him recently if he felt safe. ”Not really,” he said. Not too long ago, he had a bad wound on his forearm, and I wanted to know what happened. ”I don’t remember,” he replied. But I can’t push for more. He can’t tolerate a lot of conversation. This summer I asked, “How are you in this heat?” ”Hot,” he said. Last winter I wanted to know, “How were you during the snow last week?” ”Well, cold,” was his reply — two words rather than one! That’s an improvement. I’ve known him about four years, and it’s taken our conversation that long to progress to this level. Today I sat beside him in a meeting where our county’s public hospital was being discussed. ”Do you use Parkland Hospital?” I leaned over and whispered to him. He must not have heard me right, because he turned and looked me full in the eye [he usually communicates only sideways and in murmurs] and replied, emphatically and perhaps a little testily, “PARKLAND. MEMORIAL. HOSPITAL.” He apparently thought that either it was a vacuous question or that I was hard of hearing. I didn’t give up, though: ”I know, but do you use it?” (One has to hold one’s own.) He went into a brief and mumbled explanation — something to do with ‘phases’ — but the words trailed off and I couldn’t hear them. His fingernails today were long but very clean (a first), but his t-shirt was quite grubby. I’d luckily brought along a new t-shirt for him from Target in a dark gray, because it will probably need to go at least a month without washing. “Where do you eat?” I asked him recently. ”Nowhere.” ”Well, how do you get by?” ”Oh, Pepsodent helps.” [Three words!] I burst out laughing, and he did, too. Eating toothpaste? A little street and gallows humor. So once in a while I bring along a sack of fruit cups and those little tins of tuna salad with crackers. Today I had some fresh organic bananas, which he pulled out and ate on the spot. One day, I stuck in a couple of croissants. ”Oh, croissants!” he said, delighted. Two words again. I feel very powerless about my friend sometimes, because I am powerless. I often fall back into the old trap of wanting to ‘fix it.’ I can’t, though. On a good day, I can take that step beyond fixing it and fall headlong into Grace — landing on banks of beautiful, towering, white, fluffy cumulus clouds, like the ones on greeting cards that talk about Heaven — and I can genuinely trust that everything will be fine. Other days, I repeat to myself (not necessarily believing it and certainly not being able to live by it), ‘If you pray, don’t worry. If you worry, don’t pray,’ a misquote, I believe, of Martin Luther. On yet other days, I realize that to be near my friend — in his presence — is to know God directly. I don’t have to do anything — just show up and realize that Love has shown up, too. The hard part of being his friend is accepting that I can do nothing — letting go of expectations, forgetting that he’s a genius with unfulfilled ‘potential’, not expecting ‘progress’ on some sort of pie-in-the-sky bar chart. ’Progress’ may come, or it may not. However, it is not up to me. But our culture doesn’t really allow for the possibility of not ‘moving up,’ does it? Not ‘taking the pills’ in order to ‘get well’ or at least ‘function at an acceptable level’ in order to ‘fit in’? Most of the time, neither do my own built-in biases. This friendship constantly challenges me to see life… not in gradesABCDF… or dollars1to7figures… or positionsdirectorofsomething… or contributionsinkindfinancialgivingofyourtalentsandabilities — but as something that can just be still, and be more than OK — be holy and sacred. On the day before the Big Snow of February, 2010, two weeks ago, a Crisis Intervention team from the City of Dallas — (now part of the Dallas Police Department) — raided the homeless camps under a bridge. All of the personal possessions of the camp inhabitants — clothing, blankets, coats, years’-worth of belongings — were shoveled up by two bulldozers, and four to five loads comprising the contents of the ‘cardboard community’ were dumped into city trucks and taken to the landfill. Raids by the city of homeless camps are commonplace and routine in Dallas. I would suggest, however, that our city has reached a new ‘low’ in terms of human decency and compassion when a raid is conducted under these circumstances and in this weather. Where does one start to address such an occurrence? By early the following week, people in the camp were still without adequate [cardboard] shelter, blankets, coats and clothing. Their non-replaceable personal possessions were permanently lost. Think of the time that intervened between the raid and the week that followed. At our house, where family members who were without power stayed together, we built a snow igloo, drank coffee, changed wet clothing about ten times a day, scrounged firewood that was dry enough to make a fire in the fireplace, and watched movies together at night under piles of blankets. Even with the added warmth of the fireplace, the central heating rarely stopped. It was a great snow — a fun adventure. Not so much fun, however, if you’d just lost your cardboard home and everything you own in a raid by a city that is supposed to have your best interest at heart. Witnesses to the ‘sweep’ say that, just prior to the raid, no warning was given. The trucks arrived at 10 minutes to 2 P.M., and at 2 P.M., the dozers started scooping up the small cardboard community. It is my understanding that the city has agreed, after outrage by ‘housed’ citizens and advocates about these sweeps in the past, to give at least an hour’s notice to camp dwellers. Instead, in this case, the camp members were allowed a ‘one-time carry’: in other words, all that they could gather in their arms one time, they were permitted to keep. Of course, those who were at work at the time of the raid were out of luck. If you were allowed a ‘one-time’ carry of your personal belongings, what would you choose? Officials are also supposed to offer shelter at the time of the raid as an option. Witnesses say this procedure was not followed in this case. Here is the city’s perspective: they want to force these homeless individuals into shelters. But the individuals involved don’t want to go. The shelters provide an invaluable, lifesaving service with remarkable dedication. Yet there are good reasons why some people don’t want to go into them, feeling that they’re safer in a community on the street. If the goal of these raids is to encourage homeless individuals to get permanently off the street, it seems counterproductive to seize their belongings, when these belongings often include personal papers such as birth certificates and other identification which are critical to seeking housing. Could it be that, if we’ve spent $23 million on a homeless assistance center and still have people living on the street, their presence is simply an affront to the city’s stated goal of Ending Homelessness by 2014? These sweeps by the city are obviously ineffective, inhumane, and have been rejected by many cities nationwide as unacceptable practice in dealing with street-dwelling homelessness. It is a mark against our city that they continue here with impunity.